Carl F. Pollard’s Kiss Moon and Ken and Sarah Ramsey’s Emotional Kitten, winners of graded stakes races on the Matt WinnTurf Course, face a fleet of invaders led by Canada’s Button Down (GB), Greenwood Lodge Farm’s runner-up in Woodbine’s Canadian Stakes (Grade II), in Saturday’s 42nd running of the $100,000 Cardinal Handicap (Grade III) for fillies and mares ages 3 and up at Churchill Downs. Button Down (GB) rallied late to finish a half-length behind Strut the Course over yielding turf in the 1 1/8-mile Canadian Stakes on Sept 13. Churchill Downs oddsmaker Mike Battaglia has installed the daughter of Oasis Dream (GB) as the 7-2 morning line favorite over a Cardinal Handicap field of 12 rivals that includes Kiss Moon and Emotional Kitten, the only members of the field with stakes triumphs on the grass at Churchill Downs, and fellow European imports in the 3-year-old British-raced Wiener Valkyrie (GB), and the duo of Faufiler (IRE) and Lacy (GER) from the stable of Kentucky Derby-winning trainer Graham Motion. The 1 1/8-mile Cardinal attracted 13 fillies and mares for Saturday’s renewal, which is scheduled as the 10th race on an 11-race Saturday program set to begin with the first race at 12:40 p.m. (all times EST). Also on Saturday’s schedule is the eighth running of the $80,000 Bet On Sunshine, an overnight stakes event for 3-year-olds and up at six furlongs. The scheduled post time for the Cardinal Handicap is 5:15 p.m., while the Bet On Sunshine is set as Saturday’s ninth race with a 4:45 p.m. post. Button Down won the only two races of her career after moving to North America and the barn of trainer Josie Carroll in allowance and maiden victories at Woodbine. She was a closer runner-up in her stakes debut in the 1 ½-mile Flaming Page over the Toronto course in June, an effort that preceded to strong run in the Canadian Stakes. Carroll’s filly finished fifth of 12, beaten only two lengths, over the same course in the 1 ¼-mile Grade I E.P. Taylor won by Curvy. The 4-year-old has a career record of 2-6-0 from 13 races with earnings of $130,709. Button Down was assigned 118 pounds and will break from post 11 under jockey Paco Lopez, who won last week’s $200,000 Mrs. Revere (GII) at Churchill Downs aboard Isabella Sings. The David Vance-trained Kiss Moon, a 4-year-old homebred daughter of Malibu Moon, counts the June 6 Mint Julep (GIII) at Churchill Downs and the Ladies Turf at Kentucky Downs as her only victories among five starts in 2015. Kiss Moon enters the Cardinal off a disappointing ninth-place run in the Grade I First Lady over soft turf at Keeneland that dropped her career record to 6-1-13 in 17 races with earnings of $531,829 over three racing seasons. Julien Leparoux will ride Kiss Moon, the 120-pound starting high weight, from post 12. Kiss Moon is the 5-1 second choice in Battaglia’s morning line odds for the Cardinal. 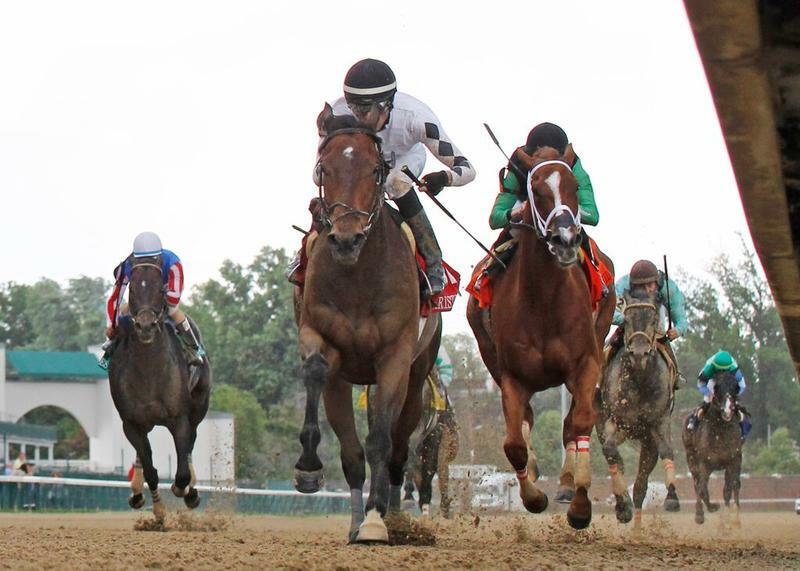 Emotional Kitten, a 5-year-old Kitten’s Joy mare bred in Pennsylvania by her owners, won the 2013 running of Churchill Downs’ Mrs. Revere (GII) at 3, but her only win in 13 subsequent races came in a Keeneland allowance race in October of last year. The career slate for the Wesley Ward trainee stands at 5-5-5 in 27 races with earnings of $556,111. Emotional Kitten, a 15-1 risk in the Cardinal morning line, will start from post nine under jockey Mario Pino. Car Colston Hall Stud’s Wiener Valkyrie (GB) is one of a trio of 3-year-old fillies in the field and was entered in last week’s Mrs. Revere, the final North American stakes race on turf for her gender and age group, but did not draw in from the roster of also-eligible fillies in that overflow field. The daughter of Sharmardal was impressive in a hard-charging runner-up finish to Stellar Path at odds of 66-1 in her lone stateside effort in the Grade III Athenia on Oct. 17 at Belmont Park. Shaun Bridgmohan will ride Weiner Valkyrie (GB), who was installed as the 5-1 co-second choice for the Cardinal off that strong U.S debut. She drew post three for trainer Ed Walker. The Motion-trained duo of Flaxman Holdings Ltd.’s Faufiler (IRE) and Gestuef Fahrhof’s Lacy loom as significant factors in the Cardinal at morning line odds of 5-1 and 6-1, respectively. Both are 4-year-old fillies making their first starts for Motion. Faufiler (IRE), trained in Europe by Pascal Bary, finished eight of 12 behind Stellar Path and Cardinal rival Wiener Valkyrie (GB) in the Athenia. She was beaten just 2 ¾ lengths and finished only three-quarters of a length behind Wiener Valkyrie. The daughter of Galileo has compiled a record of 4-2-2 in 10 races with earnings $156,980. She has failed to win in eight races in 2015. Regular rider Stephane Pasquier will ride Faufiler (IRE) from post two under 115 pounds. Lacy (GER) has failed to contend in two U.S. races, but both were against top-notch competition. The daughter of Authorized (IRE) finished last of 12 in the Grade I E.P. Taylor at Woodbine last time out after she finished seventh of nine in her American debut in the $700,000 Beverly D (GI) at Arlington Park in August. Previously trained by Waldemar Hickst, she has one win in four 2015 races and a career record of 4-2-0 in 11 races with earnings of $214,825. Joe Rocco Jr. will be in the saddle aboard Lacy, who drew post eight and will carry 115 pounds. Another invader of note is Bloodlines Racing Partnerships’ Invading Humor, a front-running 29-1 winner of the Ticonderoga for New York-bred fillies and mares at Belmont Park on Oct. 24. The 5-year-old daughter of Invasor is trained by Bruce Levine and will break from post four under Ricardo Santana Jr. Invading Humor was assigned 116 pounds. The field for the Cardinal, from the hedge out (with rider, weight and morning line odds): America Mon Amie (Channing Hill, 111, 30-1), Faufiler (IRE) (Pasquier, 115, 5-1), Wiener Valkyrie (GB) (Bridgmohan, 115, 5-1), Invading Humor (Santana, 116, 15-1), Lady Fog Horn (Albin Jimenez, 112, 20-1), Sistas Stroll (Drayden Van Dyke, 115, 15-1), Bitty Kitty (Corey Lanerie, 117, 12-1), Lacy (GER) (Rocco, 115, 6-1), Emotional Kitten (Pino, 117, 12-1), Street of Gold (Chris Landeros, 114, 20-1), Button Down (GB) (Lopez, 7-2, 118), Kiss Moon (Leparoux, 120, 5-1) and Annulment (Jon Court, 116, 15-1). 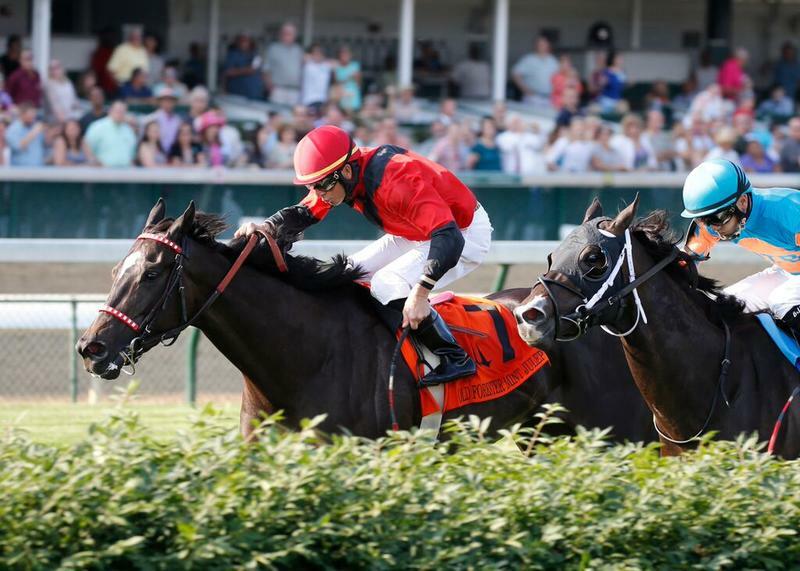 Black Hawk Stable’s Alsvid, the winner of Churchill Downs’ Aristides (GIII) in June, heads a field of nine older sprinters in Saturday’s eighth running of the $80,000 Bet On Sunshine overnight stakes. The 6-year-old gelded son of Officer finished 13th to Runhappy in the $1.5 million Breeders’ Cup Sprint (GI) at Keeneland last time out. Leading Fall Meet jockey Corey Lanerie will ride the 5-2 morning line favorite from post seven. Alsvid, winner of Oaklawn Park’s Count Fleet (GIII) for trainer Chris Hartman early in the year, will carry high weight of 124 pounds and will conceded four-to-six pounds in the six furlong Bet On Sunshine. The major rival to the favorite could be Conquest Stable’s rising 3-year-old Conquest Tsunami, winner of the Street Sense for 2-year-olds last year at Churchill Downs and the 3-1 second choice in the Bet On Sunshine. The Mark Casse-trained son of Stormy Atlantic counts three stakes victories among five wins in eight career starts. Shaun Bridgmohan will ride from post four and Conquest Tsunami will carry 118 pounds. Michael Hui’s Doubledown Again was narrowly beaten by Falling Sky in Keeneland’s Lafayette and is the 4-1 third choice in Battaglia’s Bet On Sunshine morning line. Paco Lopez will be aboard the Mike Maker-trained Rockport Harbor gelding who has a 7-8-5 record in 34 races and career earnings of 353,553. Doubledown Again will carry 120 pounds and breaks from post eight. The field for the Bet On Sunshine, from the rail out (with jockey, weight and morning odds): Candip (Calvin Borel, 120, 8-1), Brewing (Ricardo Santana Jr., 120, 8-1), Bagg O’Day (Joe Rocco Jr., 120, 6-1), Conquest Tsunami (Bridgmohan, 118, 3-1) W.B. Smudge (Julien Leparoux, 120, 8-1), Jasizzle (Perry Ouzts, 120, 201-), Alsvid (Lanerie, 5-2, 124), Doubledown Again (Lopez, 120, 4-1) and Shamrock Road (Walter De La Cruz, 118, 99-1).